The Oliphants were a Norman family who first held lands in England around Northampton. David de Olifard is commonly held to be the progenitor of the clan. In the 12th century he was granted lands in Roxburghshire, Scotland by the Earl of Huntingdon who later became King David I of Scotland. He was granted these lands for saving the King's life at the Battle of Winchester in 1114. In the 14th century during the Wars of Scottish Independence the Clan Oliphant defended Stirling Castle against King Edward I of England. However Sir William Oliphant the chief of Clan Oliphant was captured and sent to the Tower of London. He was later released and rewarded land at Gask in Perthshire. Sir William's son Sir Walter Oliphant married the youngest daughter of King Robert the Bruce. 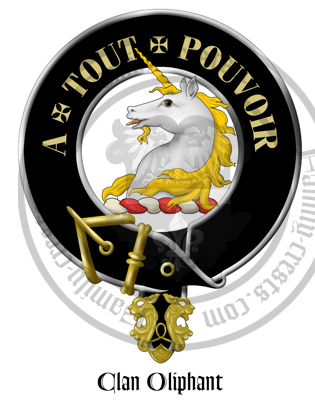 The Clan Oliphant fought on the side of the Clan Ogilvy who were also supported by men from the Clan Seton, Clan Gordon and men from the Clan Forbes of Pitsligo at the Battle of Arbroath on the 24th January 1445. Their enemy was the Master of Crawford and his Clan Lindsay who advanced with over one thousand men. The Earl of Crawford himself was the father of the Master of Crawford. The Earl rode between the two armies in an attempt to call a truce. However, an ill-advised Ogilvie, thinking that this was the start of the Lindsay's attack, threw his spear at the Earl, hitting him in the mouth and killing him instantly. So the battle began which went in the Clan Lindsay's favour. Here fell Ogilvie of Inverquharty, Forbes of Pitsligo, Brucklay of Gartley, Gordon of Borrowfield, and Oliphant of Aberdalgie, along with 500 or so Ogilvie's. However, the Lindsays lost a disproportionate amount of men, most notably the Earl himself. During the Anglo-Scottish Wars the Clan Oliphant fought against the English at the Battle of Flodden Field in 1513 where the heir to the chieftenship of the clan was killed. The third Lord Oliphant was taken prisoner at the Battle of Solway Moss in 1542 and was later released for a large ransom. During the 16th century the Clan Oliphant were staunch supporters of Mary, Queen of Scots and fought for her at the Battle of Langside in 1568. The chief's eldest son was implicated in the conspiracy known as the Ruthven Raid led by the Clan Ruthven, to kidnap the young King James VI of Scotland and was therefore exiled in 1582. The ship in which he sailed in was lost at sea. His brother, who succeeded to the title, dissipated the entire estates, but some of the family lands were saved when one of his cousins purchased from him the Gask estate. He died without male issue, but the title was bestowed by King Charles I upon the nearest male cousin, Patrick Oliphant. The ninth Lord Oliphant led the clan at the Battle of Killiecrankie in 1689 and was afterwards imprisoned. The 9th Lord Oliphant also rose up in support of the Jacobites during the 1715 uprising he led the Clan Oliphant against the British government forces at the Battle of Sherrifmuir in 1715 where the Jacobites were defeated. The Clan Olphant remained devoted to the Jacobite cause and the 10th and last Lord Oliphant was actively involved in the 1745 to 1746 Jacobite Uprising. The Oliphants fought at the Battle of Prestonpans in 1745 and the Battle of Falkirk in 1746 where government forces were defeated. The Oliphants also fought at the Battle of Culloden in 1746 where the Jacobites were defeated. The chief of the clan, Lord Oliphant fled to Sweden and ended up taking refuge in France. Ardblair Castle is the clan seat of the Gask Branch of Clan Oliphant, near Blairgowrie, Perthshire, Scotland. Kellie Castle was owned by the Clan Oliphant from 1360 to 1613. Old Wick Castle in the 14th century was held by the Clan Sutherland. The lands then passed through Christian, the daughter and heiress of Alexander Sutherland of Duffus, to William Oliphant, who was thereafter styled Sir William Oliphant of Berriedale (the progenitor of the Oliphant's of Berriedale). Berriedale Castle was obtained in the 15th century by the Oliphants. The castle had originally belonged to the Clan Sutherland who the Oliphants were allied to. Through William Oliphant's marriage to Christian Sutherland (daughter of Alexander Sutherland of Duffus) in 1497, the Castle passed to the Clan Oliphant. Hatton Castle was built in 1575 by Laurence, the 4th Lord Oliphant and replaced the previous fortalice of Balcraig Castle sited nearby. From the 17th century onwards the House of Gask is the dwelling place most associated with the Oliphant Clan. Although the land was in the hands of the Oliphant Clan from the mid 14th century, no Castle of note was built there.